Read on to immerse yourself in an amazing convergence of light, music and sound. 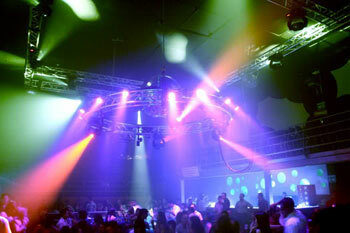 A laser lighting display or laser light show (see figure) involves the use of laser light to entertain audience. A laser light show may consist only of projected laser beams set to music, or may accompany another form of entertainment, typically a rock concert or other musical performance. 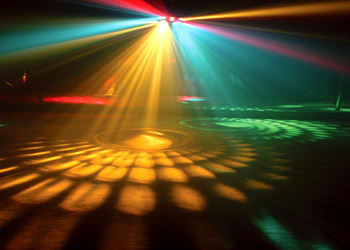 Laser light is useful in entertainment because the coherent nature of laser light causes a narrow beam to be produced, which allows the use of optical scanning to draw patterns or images on walls, ceilings or other surfaces including theatrical smoke and fog without refocusing for the differences in distance, as is common with video projection. This inherently more focused beam is also extremely visible and is often used as an “effect”. 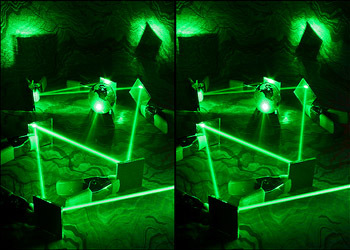 Sometimes the beams are “bounced” to different positions with mirrors to create “laser sculptures”. Laser Sculpture The brightness of laser shows is typically several orders of magnitude greater than that of the most powerful incoherent sources. This is due to the extreme directionality of a laser beam. In 1997, Marvel commissioned laser sculptures of some of their main characters. The Hulk sculpt (shown in the figure) was based from a Keown drawing and was made by Lasermach. 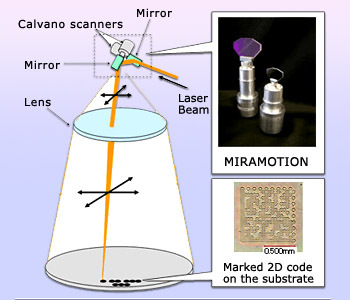 Laser scanners consist of small mirrors which are mounted on galvanometers to which a control voltage is applied. The beam is reflected a certain amount which correlates to the amount of voltage applied to the galvanometer scanner. Two galvanometer scanners can enable X–Y control voltages to aim the beam to any point on a square or rectangular raster. This enables the laser lighting designer to create patterns such as Lissajous figures (often displayed on oscilloscopes). Other methods of creating images through the use of galvanometer scanners and X–Y control voltages can generate letters, shapes and even complicated and intricate images. (The use of X–Y raster scanning to create images is also used in television picture tubes). A planar or conical moving beam aimed through atmospheric smoke or fog can display a plane or cone of light known as a “laser tunnel” effect. 'Some high-power lasers used in entertainment applications can also cause eye and skin damage if higher energy (Joule) is directed onto the human body and at a close enough range. 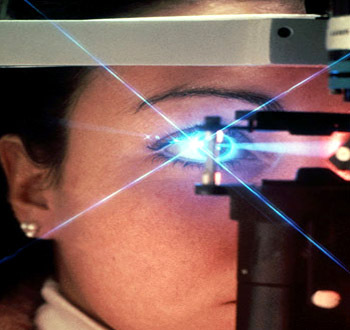 Some lasers have the potential to cause eye damage if aimed directly into the eye, or if someone were to stare directly into a stationary laser beam. Some high–power lasers used in entertainment applications can also cause burns or skin damage if enough energy (typically a stationary beam) is directed onto the human body and at a close enough range. In the US, the use of lasers in entertainment, like other laser products, is regulated by the Food and Drug Administration (FDA) and additionally by some state regulatory agencies such as New York State which requires licensure of some laser operators. Safety precautions used by laser lighting professionals include beamstops and procedures so that the beam is projected above the heads of the audience. It is possible, and in some countries commonplace, to do deliberate audience scanning. In such a case, the show is supposed to be designed and analyzed to keep the beam moving, so that no harmful amount of laser energy is ever received by any individual audience member. Lasers used outdoors can pose a risk of “flash blindness” to pilots of aircraft if too–bright light enters the cockpit. In the U.S., outdoor laser use is jointly regulated by the FDA and FAA (Federal Aviation Administration). 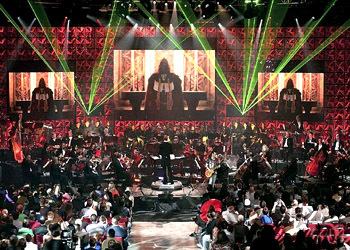 High Profile music bands use laser lights in their performance A laser light show may consist only of projected laser beams set to music, or may accompany another form of entertainment, typically musical performances. The idea of using light to accompany music goes at least as far back as 1730, when Castel came up with an early color organ. However, laser light shows fully emerged in the early 1970&apos;s and became a form of psychedelic entertainment, usually accompanied with a live musical performance on stage or pre–recorded music. Blue Oyster Cult, on their 1976 ‘Agents of Fortune tour’, and Pink Floyd, in their ‘The Flesh Tour’ were two of the first high profile bands to use a laser in their concert shows. They infamously pointed the laser directly into the crowd in shows, creating controversy over the potential for harm. This practice is now highly regulated in the U.S., to the point where almost all U.S. shows do not have laser beams go into or close to the audience. Pure laser light show The audience expect the laser light display to be the major component of the show. The idea of using light to accompany music goes at least as far back as 1730, when Castel came up with an early color organ. However, laser light shows fully emerged in the early 1970&apos;s and became a form of psychedelic entertainment, usually accompanied with a live musical performance on stage or pre–recorded music. Blue Oyster Cult, on their 1976 ‘Agents of Fortune tour’, and Pink Floyd, in their ‘The Flesh Tour’ were two of the first high profile bands to use a laser in their concert shows. Most of the original "laser shows" that exposed the public to the beauty and pure colours of lasers were in the form of art, sculpture and holography exhibitions. 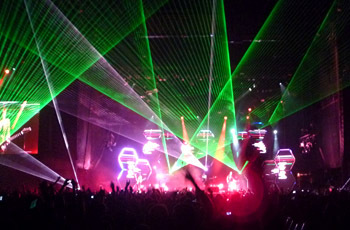 The modern audience expects the laser to be the major component of the show. 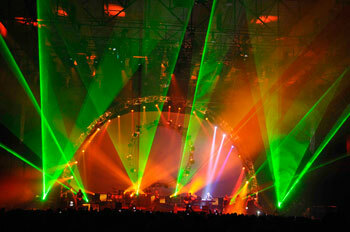 For example, lasers at a rock concert would not qualify as a laser light show. Laser light shows typically choreograph projected scanned laser images (abstract, representational and optically generated) and beam effects with a music soundtrack for a complete entertainment experience. A visual display of sound using lasers A laser light show may consist only of projected laser beams set to music, or may accompany another form of entertainment, typically musical performances. Once lasers moved from the laboratory to production and became widely available, they generated a great deal of interest and excitement especially amongst the artistic community. Early laser "shows" were often static beam array sculptures and did not use the scanned imagery we are familiar with in today&apos;s shows. 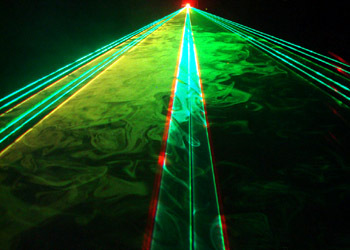 Lasers were first used in many art exhibitions which do not qualify as "pure" laser light shows since the lasers were an element of the show along with other art works. These laser art shows were the precursors of today&apos;s laser light shows. They exposed the public to the lasers pure colours and light as an art/entertainment form. Much of the early artistic use of lasers was in the creation and display of holograms. 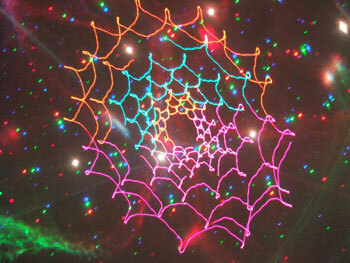 Optical transforms (diffraction patterns) were a very popular form of laser art in the early seventies. An optical transform is created by projecting laser light through an aperture and observing the results on a screen. The aperture used for the transforms was typically a black and white image recorded onto high contrast 35 mm film. The resulting projected patterns were often very complex and artistic. To make a permanent record of the transform, the laser can be projected onto photosensitive paper or photographed with a regular camera. Position detection X Y scanner The heart of the modern laser light show projector is the X–Y scanning system which allows for drawing with light to create abstract and cycloid effects. 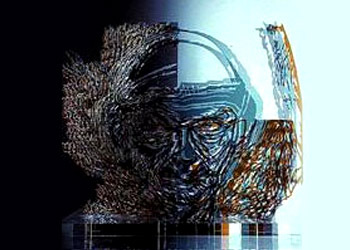 Early light shows relied on images created by mirrors attached to loudspeakers, scanning of the laser beam with motorised spinning mirrors, electromagnet–controlled springs and other techniques. While the early methods produced interesting and often repeatable scanned patterns, they lack the precise control necessary to accurately position the beam. A krypton laser powered version was also built with separate "sonic deflectors" for red, blue, green and yellow. Argon and HeNe lasers were used to create a multi–coloured, 3D light sculpture. Lasergrammetry is an innovative high-speed, non-contact measurement technology in which 3D coordinates of points on an object´s surface are determined by projecting laser spots and utilizing advanced scanning methods to measure each spot´s location. The heart of the modern laser light show projector is the X–Y scanning system which allows for drawing with light to create abstract and cycloid effects. With today&apos;s precision, high–speed, position–detecting galvanometers, scanned graphics and animations are possible. Early Laser Light Shows Laser light shows fully emerged in the early 1970s and became a form of psychedelic entertainment, usually accompanied with a live musical performance on stage or pre-recorded music. Lowell Cross took his improved Video/Laser II to the Pepsi–Cola Pavilion at Expo 70 in Osaka Japan. The four colour, four head system used a Coherent mixed gas laser, custom machined mounting and alignment system (by Jeffries) and an electronic control system (by Cross). The system was located in the "clam room" where the images were projected onto three large plane mirrors and reflected onto the floor of the room. The Pepsi Pavilion also included other interesting and unusual applications of art and technology. A book "Pavilion" by Experiments in Art and Technology edited by Billy Kluver, Julie Martin, and Barbara Rose (E.P.Dutton & Co., Inc. New York, 1972) was published documenting the Pepsi Pavilion. The book contains articles on laser systems by Elsa Garmire and Lowell Cross, including pictures of the laser effects and equipment. Argon Laser used in Rectifying Retina Problems Lasers were first used to treat eye diseases in the early 1970's and have become the standard of care for previously untreatable disorders. "There were other laser light shows at Osaka in 1970," recalled Elsa Garmire, "I remember seeing sumo wrestling on a full colour laser television over 8 feet high; it was really impressive. One other show was an amazing piece by a Japanese artist who built a scanning device that had a lot of solenoids in it, you could hear them clicking. The people sat up the sides of a cubic pavilion. There were argon lasers around the top and some kryptons that were beamed down into the centre onto this machine that threw beams of light all around the space. It was a very 3D experience." 1971 saw the first large–scale laser projections when Willard Van De Bogart created laser images in concert with the Los Angeles Philharmonic Orchestra. The images were projected onto a 40 by 40 ft screen and generated by a complex of optical glass, fibre optics, rippled plastics and mirrors. Laser Imaging Laserium was the first company to commercialize the laser light show as a form of entertainment. Ivan Dryer realised that movie film could not capture the pure, intense colours, the scale and the delicacy of the laser images created by Dr. Elsa Garmire. 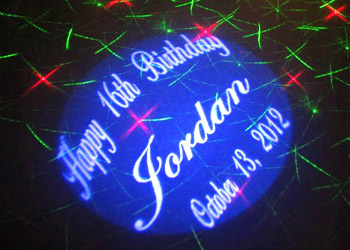 Only live projection of these effects with a laser could capture the excitement. Elsa Garmire told the author, "Dale Pelton, Ivan and I worked together and it was his idea to take the Cal Tech laser, which we did, to the Griffith Observatory. We demonstrated it to them and they liked it! We were among the first laser light shows. Actually, the first laser light show was Lowell Cross, way before the Osaka show which I was involved in." Dryer, Garmire and Pelton (who both later departed) formed "Laser Images Inc." using the then–young technology of X–Y scanning, plus several layers of lumia and various "sunglasses" performed the first Laserium® Show at the Griffith Observatory in Los Angeles in November 1973. Laserium® was the first company to commercialise the laser light show as a form of entertainment. Ivan Dryer is acknowledged as the father of the laser light show industry. Projection of Words using Lasers Laser light shows are even molded to generate words with their presentation. The early Laserium® shows were a mixture of non–representational scanned colour modulated abstract and cycloid effects, with optical effects, created by lumia and diffraction gratings. The shows were choreographed to recorded music and the laser portion was performed live by the laserist. They typically took place in planetariums as the star field projections could be used as a very effective background. Since the laserist had full control of the system and could react to the audience, no two shows were exactly alike. This probably explained why many in the audiences were repeat customers. Strobe Lights The ability of strobe lights to "freeze" the motion of rapidly moving objects by making them visible for only a fraction of a second makes them very useful in photography and in measuring vibration and other types of high-speed motion. 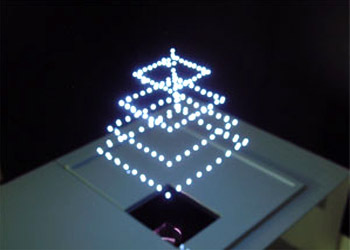 With the advent of position–detecting galvos and microcomputers, it became possible to accurately position the beam, thus allowing for the projection of words, pictures and animations with the laser. Early systems used images created with a digitising pad and stored in PROMs for X–Y playback. This gave a limited number of graphic images in the show to complement the mostly non–representational imagery. The first automated laser show was "Lovelight" which opened Feb. 4, 1977 at Boston&apos;s Hayden Planetarium. This was a ground breaking show as it had an original soundtrack (including lyrics for some selections) created to illustrate the entire history of life on earth. It began with the Big Bang, progressing through primordial life–forms, early cultures, and proceeding to a humorously–depicted space launch. The projection system was based on a multimode krypton laser and used separate blue, green, yellow and red scan heads with acousto–optic intensity control (which was an innovation at the time). Control tracks were multiplexed (X–Y to one track) and FM–modulated onto an 8-track instrumentation recorder. The basic technique of stereo displays is to present offset images that are displayed separately to the left and right eye. Both of these 2D offset images are then combined in the brain to give the perception of 3D depth. Another milestone in the development of laser light show technology was the first presentation of stereoscopic laser 3D in 1986. To project the separate left and right eye views required for perception of a 3D image, the laser projection system used one scan pair for each of the left and right eye images. Polarising material was mounted in front of each scan head in an orthogonal orientation. The audience viewed the presentation using orthogonally polarised glasses. Since the polarised material transmits all laser lines, this technique allowed for the perception of full colour images in 3D.